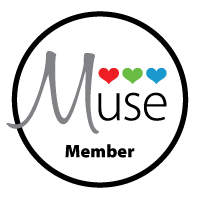 I am playing along with Muse #23 this week, where our Muse is Anita with this gorgeous card. I have only recently begun following Anita's blog, and I was so happy to have the chance to make a card inspired by her. She is so talented, and also leaves such nice comments on my blog, which I read to myself in my head with a French accent. One thing I have learned this week is that playing at the end of the challenge means that all the good ideas are used up. Either that, or my brain is being slow. I took a quick look at the gallery before starting this morning, and was blown away with the number of beautiful cards, any number of them making me slap the side of my head saying 'why didn't I think of that first'. So, I tried to take a different approach--I focused on the dots, the bling, and all that beautiful white space. 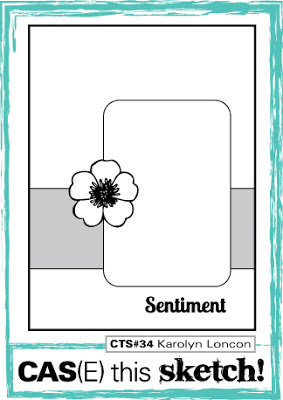 Also, I picked a sentiment from the same Paper Smooches set as Anita used--Sentiment Sampler has got to be my all time favorite Paper Smooches set. Next up is my entry into this week's RetroSketches RS#70. I used a Beautiful Butterflies die and some papers from Basic Grey Clippings to create my focal point for this anniversary card. 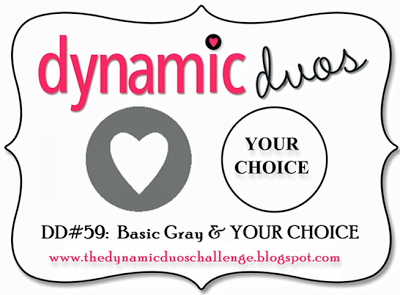 Last up today is a card for this week's Dynamic Duos DD#59, where I used Berry Sorbet along with Memento Grey Flannel. 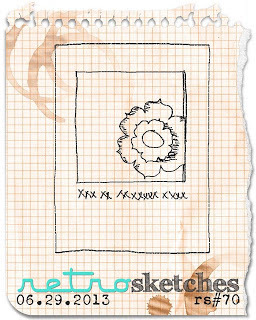 I followed the sketch at CAS(E) this Sketch CTS#34. I inked up a Plain Jane set from Verve for the first time, too. It is the last day of June and time for my monthly post with my "12 Kits" Group. Reveal day is always such fun, as I get to see what everyone else did with the same supplies I received. This month our focus is back to Christmas, and our host is Jeanne from A Kept Life. Here is a picture of the gorgeous kit she sent us. There were so many fun elements in this kit, and it was chock full of supplies that were new to me. I have a hunch that Jeanne may actually own everything there is to own in the crafting world, and that she used most of it for this kit. I made 7 cards this time--and I still have lots of supplies left over to case some of the wonderful designs I'm sure I'll see as I hop around our group. Believe it or not, the first card I made with my Christmas kit was a Valentine. Go figure...Maybe it's a Jewish thing, but when I saw those die cut birds perched within the heart, I thought 'Valentine'. Isn't this just the cutest treat holder? I thing this would be wonderful filled with some holiday chocolates or mints. I did turn to some sketch challenges for inspiration. This card is based on this week's Freshly Made Sketches #92. That's it for me today. If you want a complete supply list, head on over to Jeanne's blog. I am eager to see what the other members of our group did, and I'll bet that you are too. Thank you so much, Jeanne, for sending such an incredible kit. Happy Saturday. 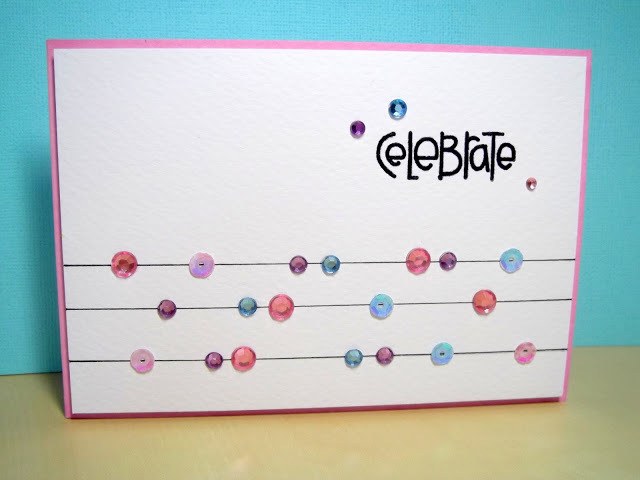 My first card today is for this week's CAS-ual Fridays challenge CFC107, to use an arrow. I pulled out some brand new Memento Teal Zeal ink along with PTI Hawaiian Shores and New Leaf and used the arrow image from Sketched Shapes to make a masculine birthday card. I think I'll drop this one in the mail later today for my brother-in-law's birthday. My next card is for this month's Avery Elle June Challenge. I inked up two sets that I just received--Modern Leaves and Party Animal to make my card, and used some of the inks that were still on my desk from my first card. Isn't that little balloon animal cute? He is embossed in Teal Zeal. 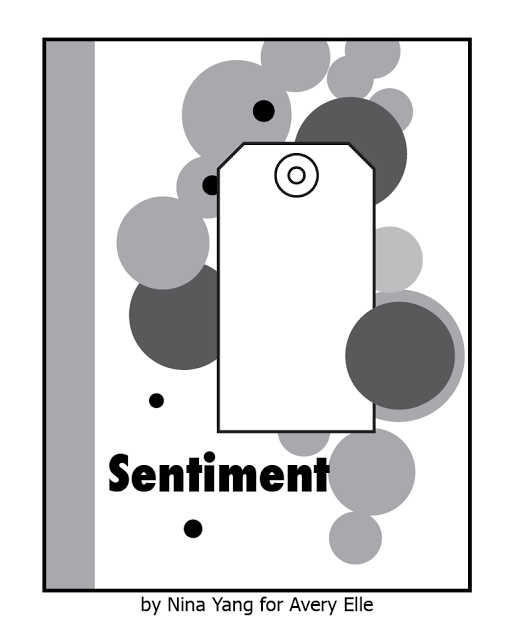 My last card for today is for this week's CAS(E) this Sketch CTS#34 challenge. Going with the inks that were already out as well as my desire to ink up some new stamps, I used my new Hero Arts Newspaper Owl, as well as my very first Neat & Tangled and CASUAL Friday's stamps. My youngest daughter's birthday is coming up, so this card is for her. I will also be entering all of these cards into this week's Simon Says....Anything Goes challenge. 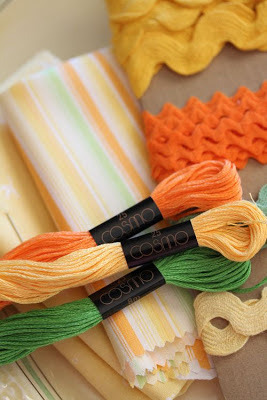 I'm here today with a card for this week's Moxie Fab Tuesday Trigger: Scene in Tangerine. I was inspired by the colors, the rick rack, and the embroidery floss. I was dying to use my brand new Lil Inker's Fanfare die, so it is probably no surprise that when I saw the rick rack I immediately thought 'FANFARE'. I am also entering this card into this week's Simon Says...Anything Goes challenge. Have you jumped on the sequins bandwagon yet? I have, and in a big way. I have joined forces with a few friends and split lots of sequin colors from just about every place who is selling them. Here is what I just got at Michaels to help me organize them. I love that these little containers all nest together and then fit in a small, flat case. Just between you and me, I need another one, as I still have a few more colors to put away. The best part--I got this at Michaels in the beads department, and it cost $5.60 with a coupon. Can't beat that. 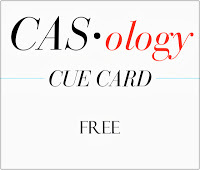 My card is for this week's ColourQ cQc #195, CASology #50 where the key word is 'FREE', and Simon Says....Anything Goes. When I saw Cathy's butterfly card here, that Elton John song started running through my head, and I could not get it to stop (...butterflies are free to fly, fly away....). So, I decided I would also use butterflies for my 'FREE' card. I was also inspired by Lisa's butterfly card here. I used two butterfly dies from Serendipity, sent to me by my sweet friend, Jeanne. I used the solid die to cut butterflies out of my front panel. I filled those negative spaces with the detailed butterfly die cuts in Aqua Mist, SU Pale Plum and Spring Moss. The sequins cover up some holes left by the solid butterfly die. It appears that this die was not designed to cut where the negative would be used, but thank goodness for sequins. It feels good to be back in the crafting mode. I received lots of packages when I was gone, and I am excited to pull out a few new things and play. 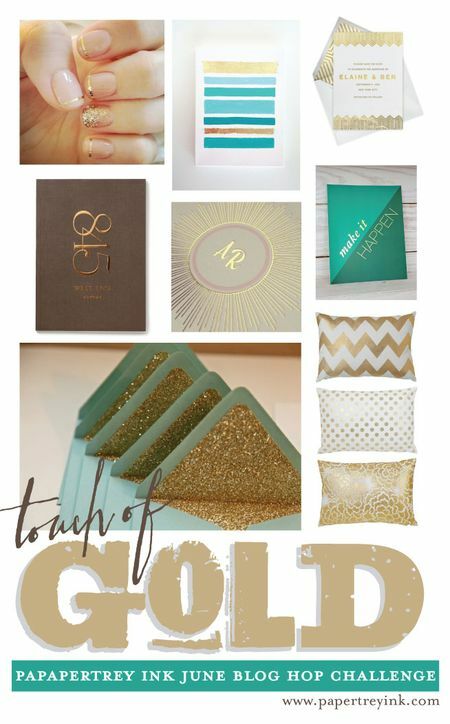 The theme of this month's PTI blog hop is Gold. Apparently, it is very trendy. I never know about these things, until I read about them. Here is our inspirational photo. I am writing and scheduling this post ahead of time, because I will be traveling a bit. I did not want to miss out on the hop, and made one of my quickest cards ever, in between spurts of packing. I think that my all time favorite PTI stamp set is Harvest Berries, and every time I see someone use it, I am reminded to pull it out and make something. In this case, I saw this card over on Amusing Michelle's blog, and decided to make a gold embossed wedding card. I stamped the branches and sentiment in Versamark ink and then embossed with Ranger Gold Embossing Powder. Nothing more to say, because that is all I had time to do. It looks better in person, and all the gold looks the same. Enjoy the rest of the hop. I will catch up when I can. I had a few moments today to make a quick card for this week's CASology #49, where the cue word is FISH. The only fish stamp I could find was an old wooden starfish that I got from Paper Source right when I discovered stamping. I don't know if I ever even used that stamp before today. I cut a square mask and stamped the Crackle stamp in Baja Breeze in the square, then stamped and cut two starfish, popping one up with dimensional adhesive. I like the clean and serene feeling of this card. I will be gone for several days, so the blog will be quiet and I won't be around for comments. I'll try to catch up when I return next week. 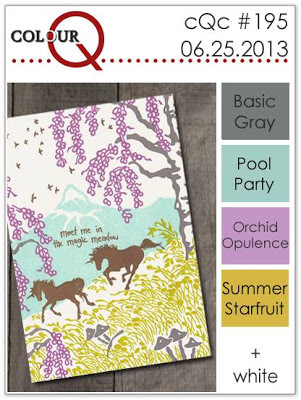 I am just popping in quickly to share a card I made for this week's ColourQ cQc #194. I've had this idea for a while because I have seen it done elsewhere--I cut a memory box die (Whimsy Circle) out of True Black, Tempting Turquoise, Calypso Coral and Green Galore, and then pieced the colored parts back into the black outline. It was a bit more time consuming than I had expected, mostly because that die needs to be run back and forth a few times with a shim in my Big Shot, and then every single bit needs to be poked or picked out. Happy summer everyone. 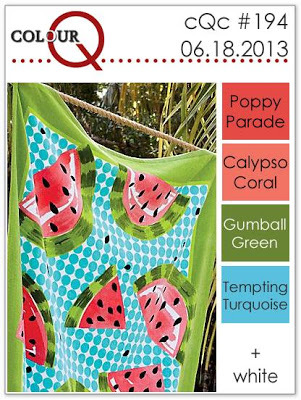 I have a super quick card for this month's Waltzingmouse Blog Party, where the theme is Summertime Fun. One of my very favorite things to do in the summer is see the fireworks on July 4th. We always go to La Costa for their Independence Day party. Great food, awesome fireworks and music, and nothing to prepare or clean up. This year, my oldest will be away at a writing program on July 4th, so I will send her this card. I used the new 1776 set for this card--it was so quick and easy to pull together a card using this set. I look forward to playing with it some more. For an Irish Lass, Claire sure captured everything anyone would need in this set. I was sunk the moment I saw the Statue of Liberty stamp. Enjoy the rest of the party. I am looking forward to seeing everyone else's idea of summer fun.